No party plans in the pipeline, the lawmaker assures. MP Nadiya Savchenkoin Lviv presented on Tuesday, 27 December, her own public platform, the RUNA (The Movement of Ukrainian People). The lawmaker recalled that on 2 August she presented their suggestions to the new Constitution. People have heard her ideas and began rallying around her, she said. She said the public platform was not a political project. "A party is just a tool and we will have it when we need it. Currently, it's just a natural association of people who respond to the very essence, the very idea rather than slogans and some kind of populism," said Savchenko. She said the public platform RUNA is a movement of active-minded Ukrainians. "These are reforms of the Ukrainian people for the sake of changing the system, a real change. This is the revolution of the Ukrainian people as an exclusive requirement of the Revolution of Dignity," she added. Among the RUNA leaders on the rostrum we also Nazar Mukhachiv (Kyiv), a Maidan field commander, and Teodor Dyakiv of the expert group Popular Sovereignty (Lviv). Theodore Dyakiv said that the RUNA will seek to replace "the current representative democracy with a controlled representative democracy", whose purpose is to build in Ukraine a "decentralized unitary republic" to avoid any hints of federalism. The new model of local self-government, according to Dyakiv, suggests "a simple mechanism for election and recalling of a village council chairman." "A community has the right, according to our project, to recall an erroneously elected chairman and appoint another." The heads of local councils will form district councils "with new powers. Likewise will be elected district prosecutor, heads of police and local district court, Dyakiv said. All the resources in the district should be controlled by the community. Overall, the RUNA advocates confiscation of wealth from oligarchs and its redistribution in favor of the people. On 2 August, Savchenko outlined his vision of a new constitution . She suggested that the Ukrainian people should elect 100 experts who will behind doors write the new version of the fundamental law for Ukraine. 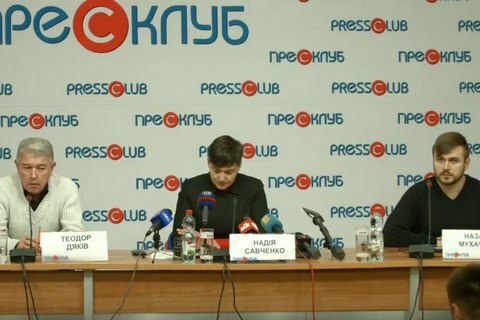 Savchenko suggested developing a new administrative-territorial division of Ukraine; the establishment of municipal police, territorial defense units; free carrying of weapons; election of judges and prosecutors at the local level; with one national court of appeal for administrative and criminal cases; introduction of national control over mineral wealth and public resources; security forces and army remain in state control; creation of a new legislature named People's Power elected on majority system and with the right of recalling deputies; a government without ministries; deprivation of the office of president from most of powers, leaving to president mostly representative functions and powers of the commander-in-chief in times of war.